Often overshadowed by the United States and the Soviet Union, France became the fourth country to possess nuclear weapons after its first test in 1960. While development was slowed by the impact of World War II, the achievements of early French research were critical for nuclear development worldwide. With nuclear secrecy strictly enforced by the United States during the Cold War, France independently developed its nuclear program and proliferation became a part of French national identity. France is also notable for its development of nuclear power, and today still generates the majority of its electrical energy from nuclear power plants. The French nuclear program, much like the Manhattan Project, was sparked by the outbreak of the Second World War when Nazi Germany invaded Poland on September 1, 1939. The French effort, however, was not at this time focused on building a bomb but rather on France’s dire need for energy to fuel its war effort. While they were likely aware of the possibility of the atomic bomb, prominent French scientists believed that nuclear power could provide the answer to France’s energy needs. Nuclear research was led primarily by physicist and chemist Frédéric Joliot-Curie, the son-in-law of famed French scientist Marie Curie and the husband of Irène Joliot-Curie. The Joliot-Curies had together won the 1935 Nobel Prize in Chemistry. In 1937, Frédéric Joliot-Curie accepted a teaching position at the Collège de France in Paris, where he also set up a laboratory complete with the first cyclotron in Western Europe. Together with physicist Lew Kowarski, Joliot-Curie achieved a fission reaction on January 26, 1939. They observed radioactive fragments, an indication that a sustained chain reaction might be possible. According to Kowarski, Joliot-Curie noted, “Well, it’s very amusing of course, but I can tell you that I’m quite sure that this discovery has already been made in other places.” He was right, as other scientists had conducted nuclear fission experiments, but according to Kowarski, Joliot-Curie did not know and was merely guessing. Armed with this information, Joliot-Curie decided to seek further government investment by building a model of a self-sustaining chain reaction. The problem lay in procuring the materials; it would require both uranium and heavy water. The uranium was obtained without incident from the Brussels Union Minière, a Belgian company mining uranium in the Congo, but the heavy water proved much more difficult. The only supply of heavy water at the time was produced at the Norsk-Hydro Plant in Norway. As the French would soon discover, the Germans were also interested in procuring it, an indication that they were likely working on their own atomic energy project. In February 1940, Armaments Minister Raoul Dautry sent banker Jacques Allier to the Norsk-Hydro plant with instructions to purchase the heavy water. Joliot-Curie also gave Allier a tube of cadmium, telling him, “Keep this with you always. If the containers of heavy-water are in danger and you don’t have time to empty them, pour a little in each one. The contents will immediately become unusable” (Pflaum 353). The secret plan worked perfectly, as Allier returned to Paris with 26 seven-liter canisters of heavy water, the entire world’s supply at the time. Despite their successes in obtaining experimental materials, the German invasion of France in May 1940 put a hold on further research as the French were forced to hide their supplies of heavy water and uranium. The Belgian uranium was shipped out of the country to Morocco, where it remained safely for the duration of the war. The heavy water, known only as the product “Z”, was moved in the dead of night to the Banque de France’s Clermont-Ferrand branch by Joliot-Curie’s lab assistant, Henri Moureu. After it became clear that the Germans would take Paris, the heavy water was moved again, this time to the Central Prison at Riom, before being taken to England by Kowarski and Hans Halban aboard the S.S. Broompark. It would be used in vital experiments by British and French scientists proving that a self-sustaining chain reaction was in fact possible. 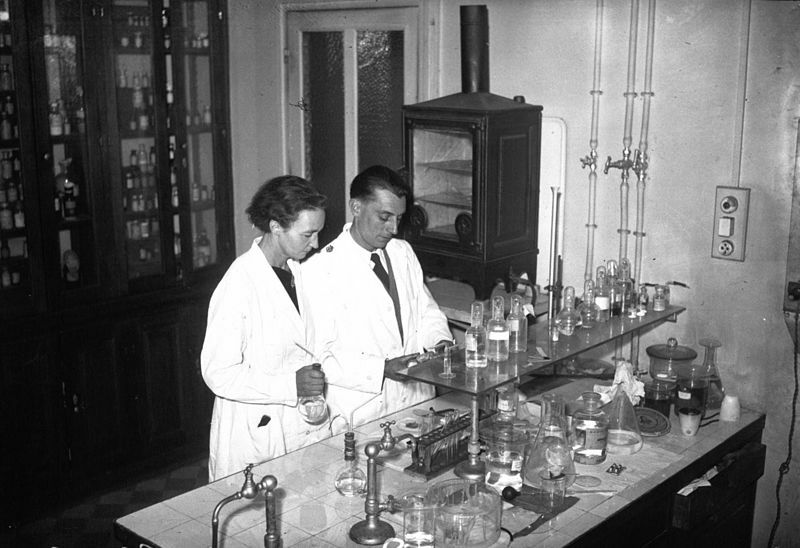 While many prominent French scientists fled in advance of the German occupation, Irène and Frédéric Joliot-Curie decided to remain at their lab in Paris. The Joliot-Curies did not collaborate with the Germans. Rather, they viewed science as patriotism, and were determined to continue the French scientific effort. Under intense interrogation as to the location of the French uranium and heavy water supplies, Frédéric Joliot-Curie hid his knowledge of their respective locations. The Germans were particularly interested in Joliot-Curie’s cyclotron, as they had not yet developed one of their own. Nevertheless, Joliot-Curie never knew until after the war that a chain reaction was in fact possible, as he did not have time to complete his heavy water experiments before the Germans invaded. Thus, Joliot-Curie primarily researched the effects of radiation during the war, while efforts to build a nuclear reactor were tabled. He would go on to join the French Resistance. During the liberation, Joliot-Curie assisted with the Allied Alsos Mission by providing information about his work with German scientists. With the liberation of France and the return of prominent scientists including Kowarski, Halban, Jules Guéron, and Bertrand Goldschmidt, Frédéric Joliot-Curie was determined to restart atomic research as soon as possible. Nevertheless, General Leslie Groves was concerned about Joliot-Curie’s communist ties. Fearing that Joliot-Curie would pass secrets to the Soviet Union, Groves kept tabs on him and his colleagues, even recording their conversations in London. Despite the American atomic bombings in Japan, Joliot-Curie remained steadfast that the French program should pursue peaceful uses of atomic energy. The day after the bombing of Nagasaki, he published an article in L’Humanité asserting, “It is…true that the immense reserves of energy contained in the uranium devices can be liberated slowly enough to be used practically for the benefit of mankind. I am personally convinced that…it [atomic energy] will be of inestimable service to mankind in peacetime” (Pflaum 416). Joliot-Curie’s pleas for government investment were heard by the newly appointed head of state, Charles de Gaulle, as France was once again in desperate need of energy with its coal and oil reserves vastly depleted. On October 18, 1945, the Commissariat of Atomic Energy (CEA - Commissariat à l'énergie atomique) was formally created. Its stated mission was to “pursue scientific and technical research in the view of using atomic energy in the various domains of science, industry, and national defense” (Hecht 58). Joliot-Curie was named the high commissioner in charge of all scientific and technical work, while Raoul Dautry was appointed general administrator, and handled the administrative and financial side. From the beginning, the CEA had significant political influence and it reported to the President of the Council of Ministers, not to any particular ministry, giving it relative autonomy. Its headquarters were established at the Fort of Châtillon, approximately three miles south of Paris. Despite the objections of General Groves, Kowarski, Gueron, and Goldschmidt, who had worked on nuclear projects at the Chalk River Nuclear Laboratories in Canada, came to an agreement with Washington for working on the French atomic program. They would only be allowed to share information with the French project that they themselves had worked on at Chalk River. The CEA quickly established three long term goals: to establish a heavy water and uranium reactor which could create radioactive isotopes, to then use those isotopes to build a larger pile and a nuclear center, and then finally to build a nuclear power plant. The first of these goals was achieved on December 15, 1948, when France’s first atomic pile, a uranium and heavy water design, went active at 12:12 PM. Intended to produce just five kilowatts of energy, the reactor was named Zoé (an acronym for Zéro énergie, or zero power as the reactor produced very little, Oxyde, or uranium oxide, and Eau lourde, or heavy water). Unlike the Manhattan Project, the success of the CEA did not remain a secret. French newspaper L’Aube called it “a great achievement, French and peaceful, which strengthens our role in the defense of civilization.” President Vincent Auriol affirmed, “This achievement will add to the radiance of France” (Hecht 2). The success of the Zoé Reactor quickly buoyed the advancement of the French nuclear program. In 1949, a plutonium extraction plant was established at Le Bouchet using irradiated fuel from Zoé. A second plutonium production reactor would soon be opened at Saclay in 1952. While there were not yet any formal plans for building an atomic bomb, concern quickly spread among French scientists that their work could soon be weaponized. Frédéric Joliot-Curie publicly stated, “if tomorrow they ask us to do war work, to make an atomic bomb, we will reply: No!” (Pflaum 442). Joliot-Curie also propagated the Stockholm Appeal, a petition for the ban of all nuclear weapons, with the help of the French Communist Party. As a result of France’s growing anticommunism after a failed Communist Party strike in the winter of 1947 and a communist coup in Czechoslovakia in 1948, the CEA dismissed Joliot-Curie in 1950. In 1952, a five-year plan was announced for three large-scale plutonium production plants to be built at Marcoule in the south of France. 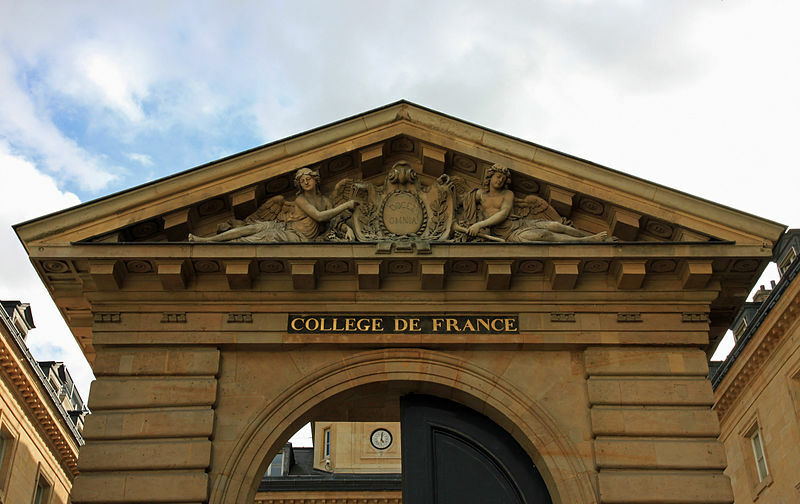 Aware that electricity would be produced as a byproduct, the CEA began working closely with Électricité de France (EDF) to use the electrical energy from these plants. The first Marcoule reactor, G-1, went critical in 1956 producing a small amount of electrical energy. The subsequent G-2 and G-3 reactors, built in 1958 and 1959 respectively, were much more powerful, capable of producing 200 megawatts of electricity. They also produced significant amounts of plutonium, an important factor in the eventual production of an atomic bomb. By the time that the Marcoule plants were under construction, France had discovered and begun mining a significant amount of domestic uranium, as well as importing some from its colony in Madagascar. Although Zoé had used heavy water as a moderator, subsequent reactors used graphite as they decided building a heavy water plant would be too extensive. Similar reactors already existed (such as in the United States). But as it was French work and French materials that developed the graphite-moderated and gas-cooled reactors, the French called it the filière francaise (the French industry). The association of national identity with nuclear abilities would soon become a driving force in the development of the French atomic bomb. Since the creation of NATO in 1949, France had long felt marginalized by the “special” relationship between the United States and the United Kingdom and even by West Germany, which entered NATO in 1955 over France’s objections. France was humiliated even further in 1956 with the Suez Canal Crisis, when British and French troops were forced to withdraw from Egypt. Furthermore, the CEA had a fraction of the resources of the American or even British nuclear programs, and with a continued fear of French communism the U.S. and U.K. were reluctant to share information. Nuclear power became not only a question of national security but of global status, particularly as a nation with colonial holdings. The French government took preliminary steps to reorganize its atomic program in 1956 under President Pierre Mendès France. Mendès France established a liaison between the CEA and the Ministry of Defense by creating the Comité des Applications de l’Energie Atomique, headed by General Paul Ely. The CEA and the Ministry of Defense also signed a memorandum committing to an eventual nuclear test. U.S. intelligence from 1957 indicated that there was increasing nationalist pressure to build a bomb. The same year, the U.S. and the U.K. agreed not to share any information from their nuclear programs with France or West Germany. By 1958, the French government was pouring its resources into the Force Nucléaire Stratégique (FNS), known alternately as the force de frappe, literally “strike force.” Nevertheless, any doubts as to the development of the French atomic bomb were washed away with the start of the Fifth French Republic and the return of nationalist President Charles de Gaulle. Frustrated by France’s exclusion from the U.S.-U.K. partnership, de Gaulle wanted to make France more independent from NATO and sought to do so largely with the development of nuclear weapons. As de Gaulle explained, “A great State which does not possess them [nuclear weapons], while others have them, does not command its own destiny” (Pagedas 5). In 1957, France had established a testing site near the town of Reggane, Algeria, an oasis in the Sahara Desert. The first French nuclear test, codenamed Gerboise Bleue (meaning blue jerboa, after the first color of the French flag and the desert rodent found in the Sahara) took place at 7:04 AM on February 13, 1960. Detonated on top of a 336-foot-high tower, the bomb had a yield of 60-70 kilotons, four times more powerful than the Little Boy bomb dropped on Hiroshima. President de Gaulle declared, “Hooray for France! Since this morning, she is stronger and prouder.” French atomic bombs would be operational for military use by 1964. Official French reports stated, “For the explosions at low altitude, the earth, the water, and varied debris… formed a vertical column between the sun and the sphere of gas heat which had the appearance of snow.” Soon after the tests began, the French military quickly established a 150km “contaminated zone” around Reggane. The French Senate has since stated that “this confirms that certain regions nearby to the test received a significant dose of radioactivity.” The Senate also noted that since Algeria became independent, it never tried to pursue information about radiation contamination in the region, and that Saharan winds and erosion have “rendered inspections today practically impossible.” An Al Jazeera report from 2015 stated that France buried additional radioactive materials in the Sahara but that, again, winds have made further investigation impossible. France would continue testing in Algeria until 1966, almost four years after Algerian independence. Three more atmospheric tests were conducted at Reggane, sparking condemnation and protests from a number of African countries. A subsequent series of underground tests were thus conducted near the village of In Eker in southern Algeria. The Reggane testing site was not returned to Algerian control until January 15, 1967. Between 1961 and 1966, France conducted 13 underground tests. Having tested its own nuclear device, France sought inclusion in the U.S.-U.K. nuclear sharing program. The United States, however, was only willing to share its nuclear secrets within the structure of NATO, suggesting a multilateral force (MLF), a group of ballistic missile ships and submarines crewed by an international NATO coalition. De Gaulle rejected this proposal as an American attempt to gain political control of France’s nuclear forces, asserting, “On matters of great importance a sovereign nation will exercise its sovereignty on a unilateral basis” (Pagedas 84). The MLF never came to fruition and was mocked by the Tom Lehrer song, “The MLF Lullaby.” France went on to withdraw from NATO’s integrated military command in Brussels in March 1966, and did not officially rejoin until 2009. By 1960, President de Gaulle was aware that France was going to lose Algeria, and began looking for a suitable testing site elsewhere. Construction of testing sites began soon after at the Tuamotu atolls of Mururoa and Fangataufa in the South Pacific, and the first test was conducted on July 2, 1966. France would go on to conduct 192 additional tests in French Polynesia. The French government assured the native inhabitants that there would be no danger, as the sparsely populated island of Mururoa was 1500km from the more densely populated Tahiti, and promised that tests would only occur when the winds were blowing away from inhabited islands. They also asserted that appropriate evacuations would be undertaken and that safety instructions would be distributed. Nevertheless, the entirety of French Polynesia received at least some nuclear fallout. The island of Tahiti alone received 500 times the maximum allowed dose of radiation exposure during a test in 1974. Medical studies in recent years have concluded that testing can account for the rise of cancer in island inhabitants. 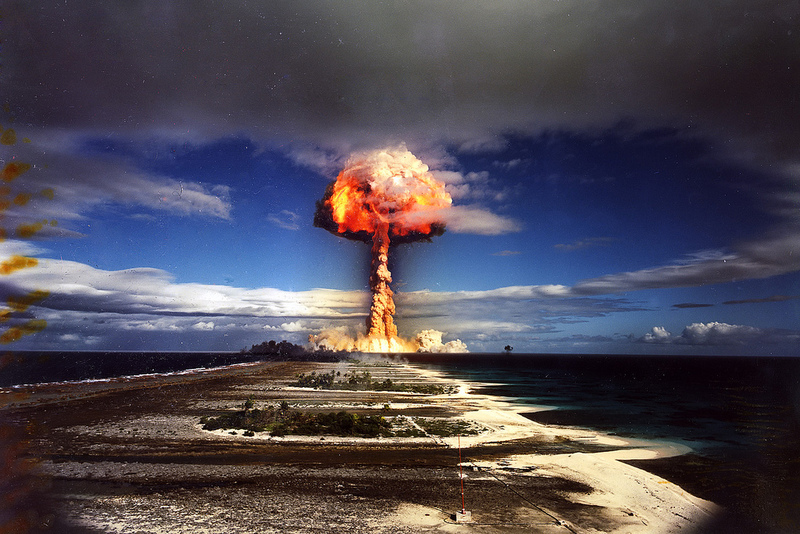 After a brief moratorium on nuclear testing in the early 1990s, President Jacques Chirac announced on June 13, 1995 that underground testing would resume in French Polynesia. The decision was condemned by countries across the globe and sparked mass protests across Tahiti. After six tests, the French testing program was officially halted in January 1996. The final French testing series provoked international protest and boycotts of French products because they conducted these tests during negotiations of the Comprehensive Nuclear Test-Ban Treaty (CTBT). The CTBT was a multilateral treaty that would ban the use of all nuclear explosions, for both civilian and military purposes. The UN General Assembly adopted the Treaty on September 10, 1996, but it has not been enforced because eight states have not ratified the Treaty. However, in 1998, France became one of the first countries to sign the CTBT, and they then closed all of their test sites. French nuclear testing caused both health complications and environmental issues. The International Physicians for the Prevention of Nuclear War (IPPNW) conducted studies to determine the effects of fallout. The Béryl Test in Algeria serves as an example. This test occurred on May 1, 1962. Fallout, in this instance, spread when lava, aerosols and gaseous products were released into the atmosphere. As a result of testing in the French Polynesian atolls, fallout spread by rain-out. The rain was formed by the particles of nuclear explosions. The French medical research institution, Inserm, concluded that thyroid cancer increased for those living within 1,300 km of the nuclear tests. The testing also affected marine life in the atolls, causing biodiversity to decline and leading to the disappearance of some reptiles and birds. In Moruroa, nuclear waste, including wood and metal scraps, were stored. When a cyclone occurred in 1981, it caused this waste to spread throughout the surrounding atolls. In 1983, scientists discovered that plutonium-239 concentrations in the air in the testing atolls were four times greater than in continental France. Underground testing triggered landslides, tsunamis, and earthquakes. In 2008, the French veterans’ organization Aven, conducted a survey with atomic testing veterans. This survey concluded that 35 percent of the polled veterans had one or more types of cancer, and nearly one in five were infertile. Blood cancer and cardiovascular problems were common among nuclear project veterans. Their children and grandchildren face similar health issues. France currently maintains the third-largest nuclear arsenal in the world with roughly 300 operational warheads. It deploys submarine-launched ballistic missiles (SLBM) as well as fighter aircraft capable of delivering a bomb. In 2006, President Chirac declared that France would consider using nuclear weapons to fight terrorism, asserting, “The leaders of states who would use terrorist means against us, as well as those who would envision using . . . weapons of mass destruction, must understand that they would lay themselves open to a firm and fitting response on our part.” In 2008, President Nicholas Sarkozy announced a reduction in the French nuclear arsenal to a maximum of 300 warheads, a position continued by his successor, President François Hollande. In 2009, the French Parliament passed a bill, which acknowledged the impact of its nuclear testing program. The bill provided some compensation for military veterans, who suffered health complications from their involvement with the testing. The bill offered a total of ten million Euros in compensation. Veterans argue this law does not go far enough because over 150,000 people participated in the nuclear test operations, including both military personnel and civilians. Minister of Defense Hervé Morin confirmed that nearly 100 soldiers were involved in tests that aimed to study the effects of radiation on humans. He declared that, “It was another era,” and that historic events should not be analyzed from the standpoint of 2010. The French government maintained that its nuclear operations were carried out in a safe manner. In 2010, Le Parisien, a French newspaper, released a confidential military report indicating that French soldiers were used in “tactical experiments” to study the effects of radiation on humans. One example of this occurred in 1961, when military personnel worked close to the site of a nuclear detonation, almost immediately after the test was conducted. Électricité de France (EDF) continues to operate 58 nuclear reactors across France, producing approximately 75% of French electricity. Due to the low costs of production, France is the largest net exporter of electricity in the world and generates billions of euros in revenue each year from its energy production. Nevertheless, rising costs and aging facilities have forced the shutdown of several nuclear plants in recent years. The French government is currently considering a bill that would lower the nuclear share of French electricity to 50% by 2025. While the French government long denied any links between its testing program and the health problems of the residents of French Polynesia, medical studies in recent years revealed a link between nuclear testing and a spike in thyroid cancer. Revelations since then have continued to prove the damage inflicted by the French nuclear program. In 2010, the French Parliament passed a law offering compensation to the victims of nuclear testing and their descendants. France tests its first atomic bomb, Gerboise Bleue, on February 13, 1960. Powers, Thomas. Heisenberg's War: The Secret History of the German Bomb. Boston, MA: Da Capo Press, 2000. Hecht, Gabrielle. The Radiance of France: Nuclear Power and National Identity after World War II. Cambridge, MA: MIT Press, 1998. Pflaum, Rosalynd. Grand Obsession: Madame Curie and her World. New York: Doubleday, 1989. Pagedas, Constantine A. Anglo-American Strategic Relations and the French Problem, 1960-1963. London: Frank Cass, 2000.